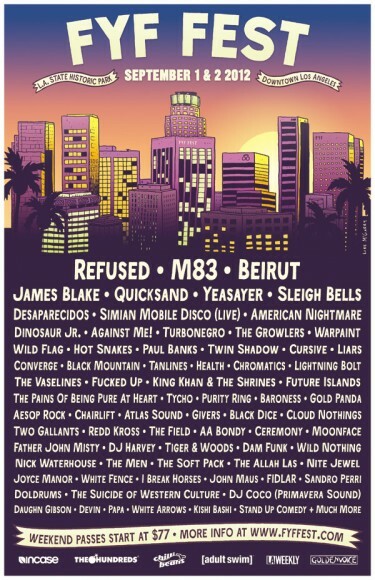 FYF Fest has announced its 2012 lineup, and the local LA promoter has seriously outdone itself this year. Now taking place over two days, September 1st and 2nd at Downtown’s L.A. State Historic Park, the fest is topped by the first post-reunion performance of the seriously electrifying punk group Refused, M83 and Beirut. Also making appearances are Sleigh Bells, the reunited Desaparecidos, the newly reunited Quicksand, Yeasayer, American Nightmare and Against Me! Ticket prices for this year’s event are $77.00 for a weekend pass and all go onsale Friday June 22nd. Full lineup below.